Ashwagandha (Withania somnifera) is an adaptogenic plant from the Ayurvedic tradition that has been shown in modern research to support stress adaptation, cognitive function and memory. A new prospective, randomized, double-blind, placebo-controlled clinical trial adds to the body of clinical research on ashwagandha. 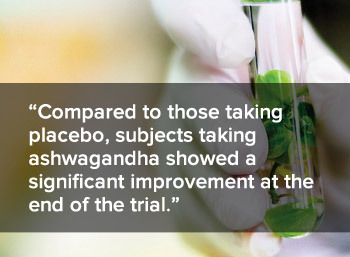 In the study, a standardized, dried aqueous extract of ashwagandha roots and leaves (Sensoril®, Natreon Inc, USA), or a matching placebo was administered to healthy human subjects in a crossover study, with the goal of ascertaining its effects on cognition and psychomotor function. Subjects consumed 500 mg twice daily of either ashwagandha extract or placebo. The researchers conducted a series of psychometric tests on subjects at baseline and at the end of the 2-week trial. Compared to those taking placebo, subjects taking ashwagandha showed a significant improvement at the end of the trial in the following tests: Reaction Time (measures attention and sensory motor performance), Digital System Substitution (measures attention, response speed, integration, and visual-motor coordination), Digit Vigilance Task (measures alertness, vigilance, and selective capacity), and Card Sorting (measures sensory, motor, integrative, and executive functions). The authors concluded that Sensoril® ashwagandha extract improved cognitive and psychomotor performance in healthy human volunteers. Pingali U, Pilli R, Fatima N. Effect of standardized aqueous extract of Withania somnifera on tests of cognitive and psychomotor performance in healthy human participants. Pharmacognosy Res 2014;6(1):12–18.